First off, THANK YOU! These stringers are ABSOLUTELY AMAZING! Fantastic design and SUPERB quality! 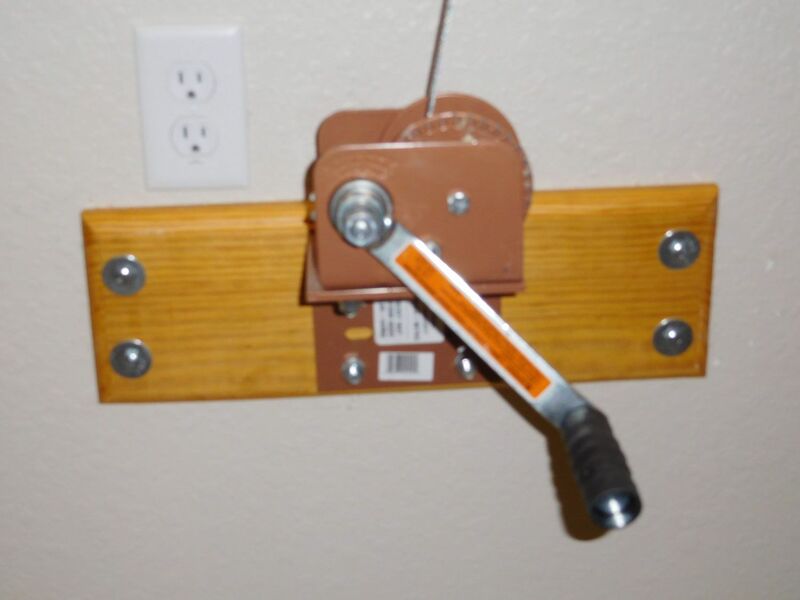 I had them painted black at an automotive paint center and bought black hardware from Grainger. It only took an hour or so to assemble and mount the treads. Simply brilliant!! The design was easy to understand and assemble. These stringers look amazing and are VER HIGH QUALITY! 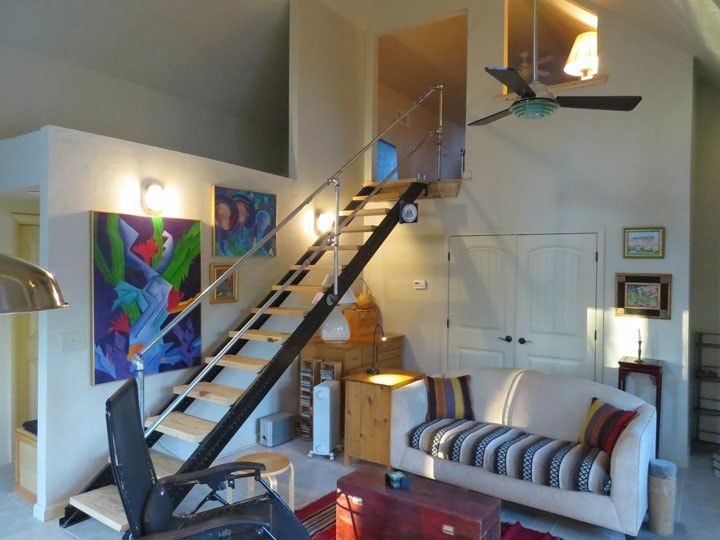 The stairs make the space. This is great. 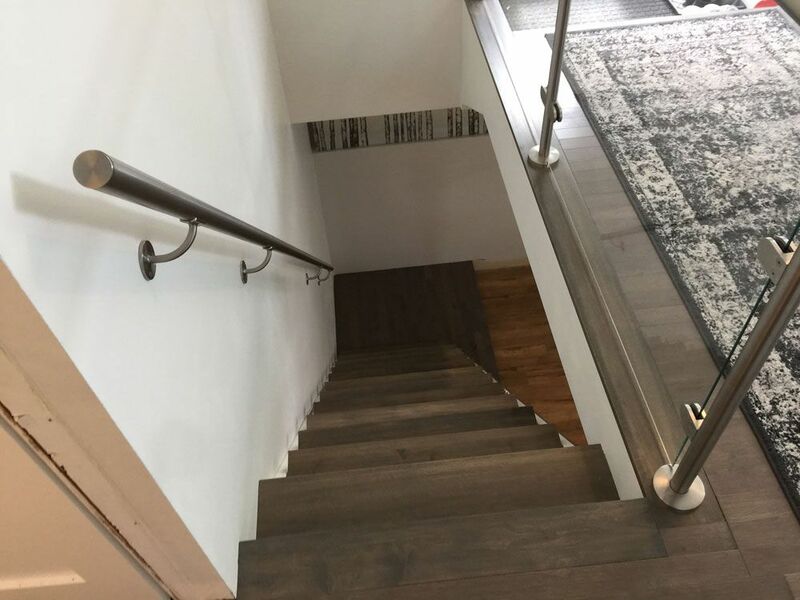 I really appreciate it and you can tell from my video (above) that the stairs turned out really good so I am grateful for the Fast-Stairs metal stringers product. Thanks. 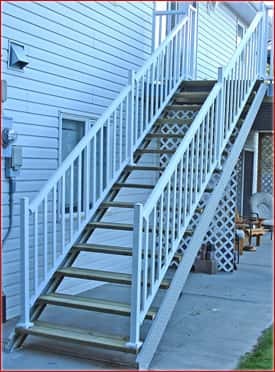 I just wanted to write in to tell you how satisfied I am with my fast stairs purchase. I just remodeled my basement and needed stairs installed so that I could enter the basement from inside my house. 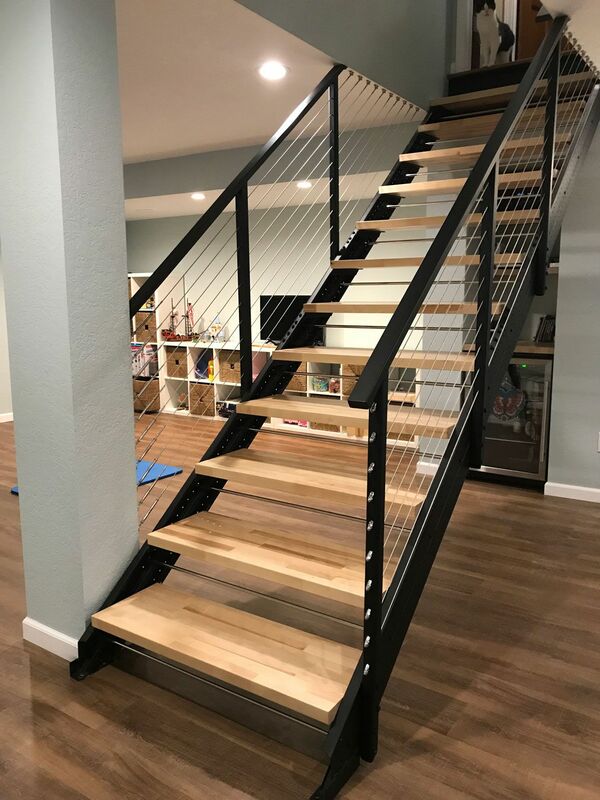 I searched everywhere but fast stairs had not only the best product as far as quality, but also the easiest product to assemble and install. 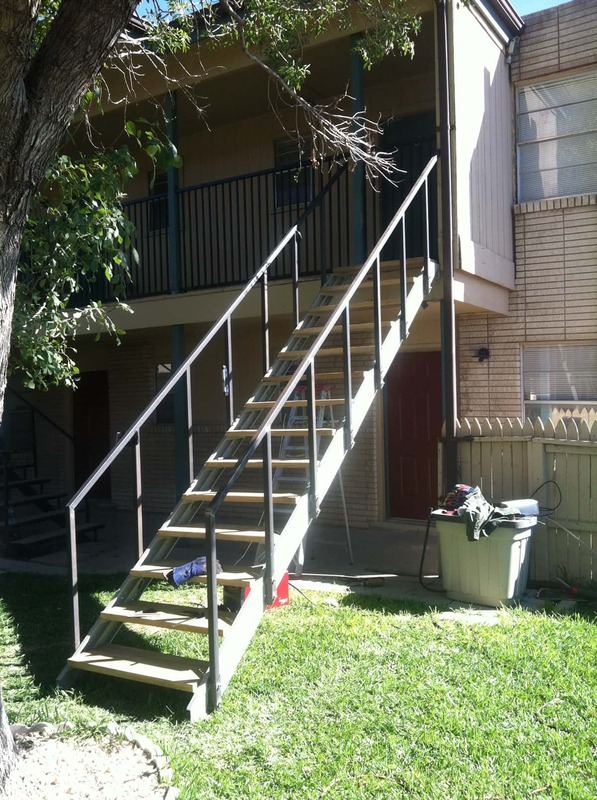 The stairs are a perfect fit and the customer service was great. The owner himself answered the phone and really held my hand and guided me to make the correct choice of stringers based on my measurements. I really want to say thank you and that I recommend fast stairs to anyone in need of a new stairs. 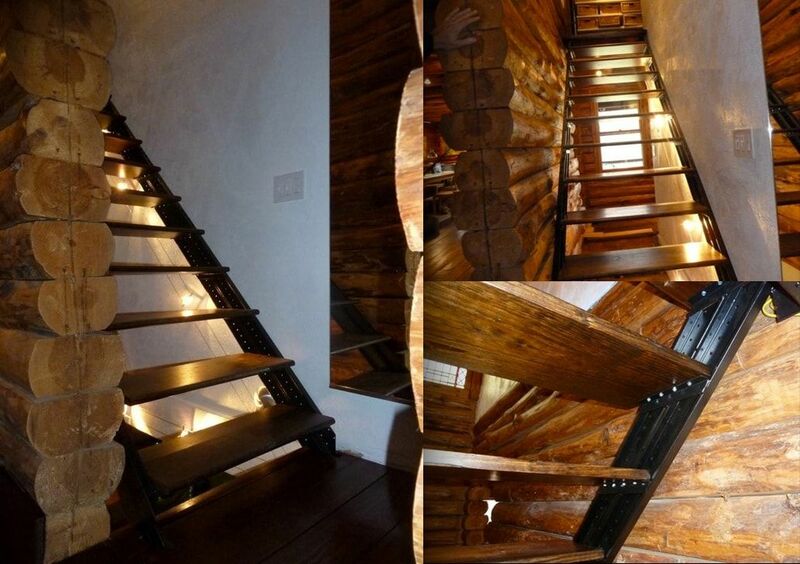 I just have to say, these stairs went together easily and the creative options are endless! 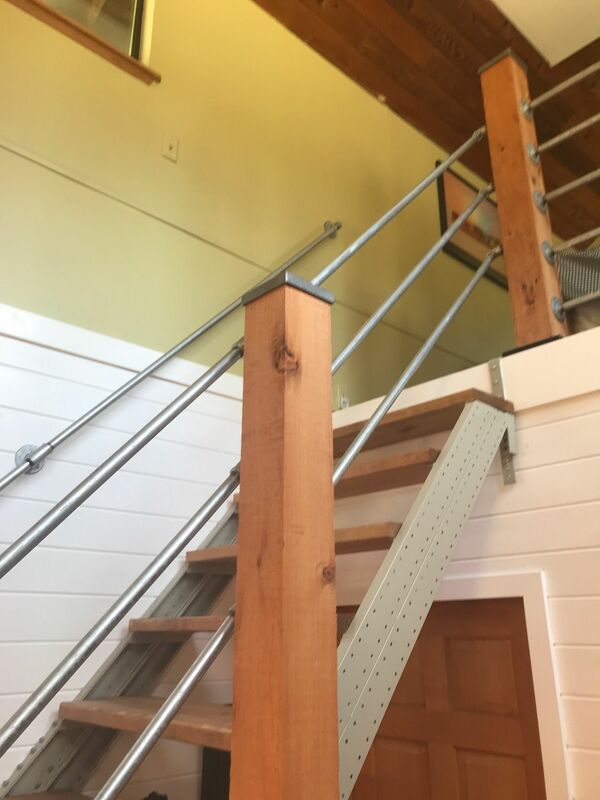 We chose to custom fabricate the guard rails and use stainless cable to really give the room an open feel. Love them! Thanks again for creating such a great product. 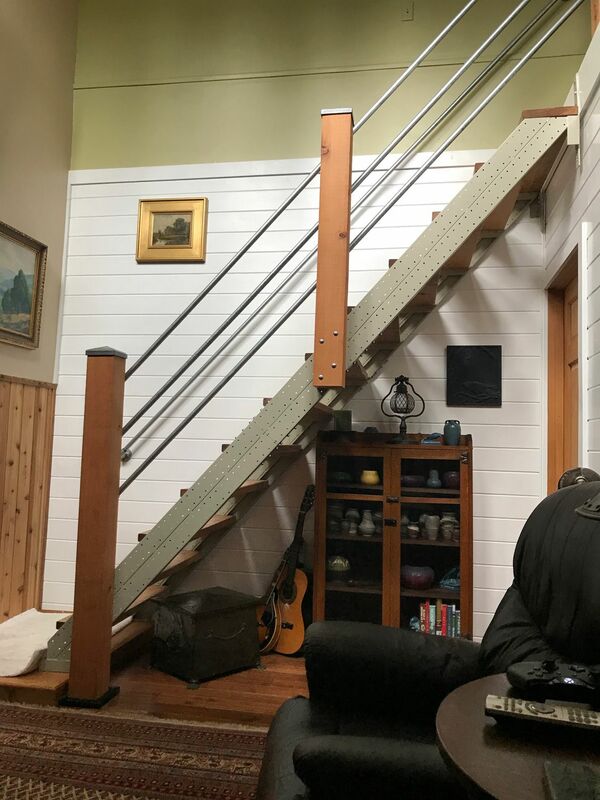 My wife and I assembled the stairs quickly and with a little help from a friend we painted and attached the stairs and installed custom treads. The stairs have upgraded the safety and added additional value to our home! I have recommended your product to several contractors and friends as a “cool” and cost effective option for existing or new stairs. 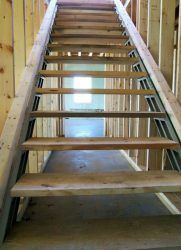 Fast stairs made my renovation much faster and easier. They are rock solid and because of the design I built a little closet underneath. All of the subcontractors asked about them. Claude, my B12 Stair Stringers kit was quite easy and quick to assemble. I did use your on line video(s) for reference and they did in fact help with the assembly of the stringers. 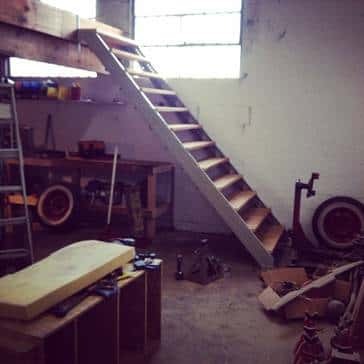 I used your stair kit for access to the loft in my shop. 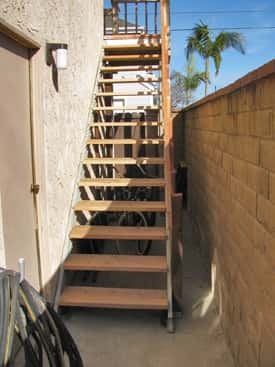 I used 2X12's for my step treads I installed a Fortress railing with a fascia mount on my stairs and installed spacer blocks between the wall and stairs that I anchored to a stud. I'd like to thank you for manufacturing such a great product that's easy to use. 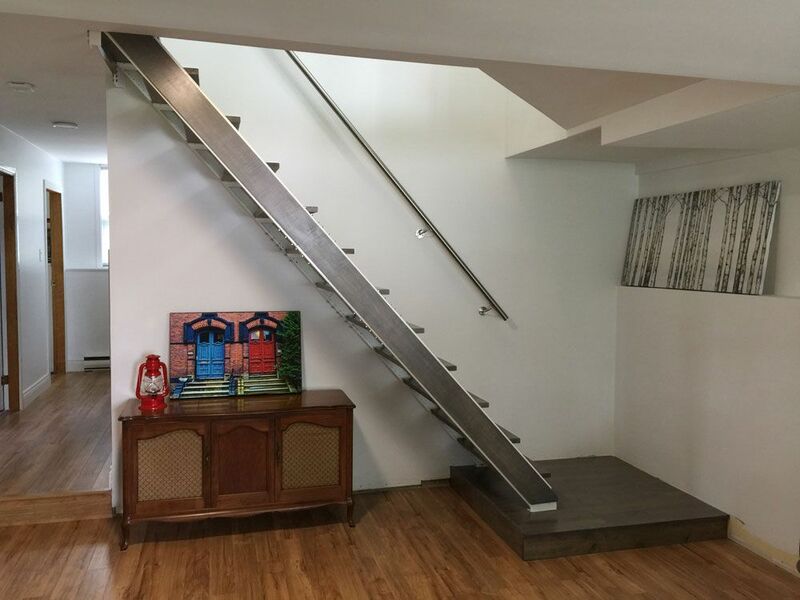 I had always hated how the ugly wood staircase imposed itself on the space. I had my revenge by ripping the wood stringers out and replacing it with a steel stringers kit ordered online. There is more space, the lines are cleaner and the oak treads will look great after a few coats of finish. I'm very satisfied. Enjoy. 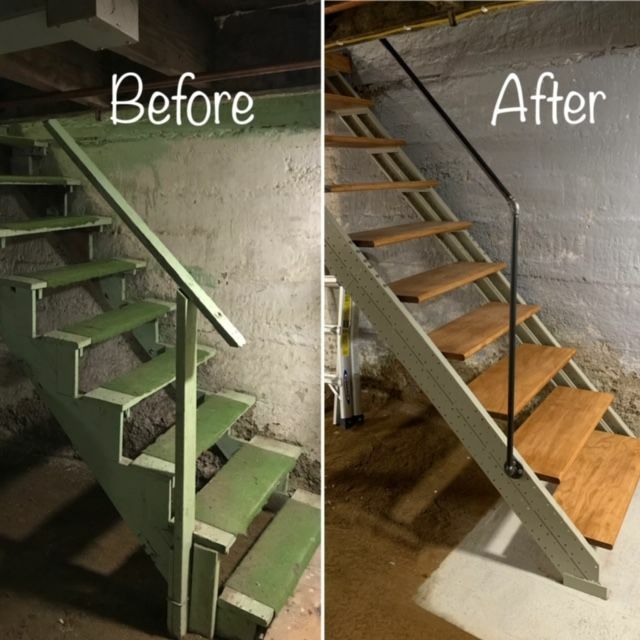 We just replaced our rickety old basement stairs using one of your kits. It was a great project, and we are really happy with the results. Thanks for making such a great product at a fair price. We found it very easy to assemble. The YouTube video really helped. 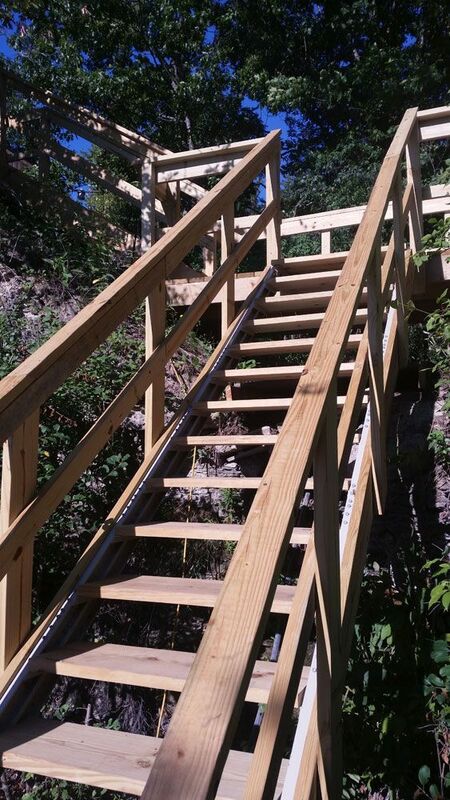 The new stairs are rock solid, and are much nicer than straight lumber stairs. Thanks again. I’m attaching a before and after photo. People LOVE the way these stairs look! We love them too. They really helped us solve a problem in an easy and affordable way. Thanks! 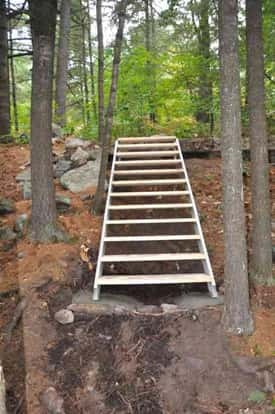 Just wanted to share the photos of stairs I built. It's impossible to imagine how I could have done it without the Fast-stairs B 16 kit. I'm a 69 year old retired college professor, not a builder, but with some help from my son in law put these up in a few hours in a very hard access spot. 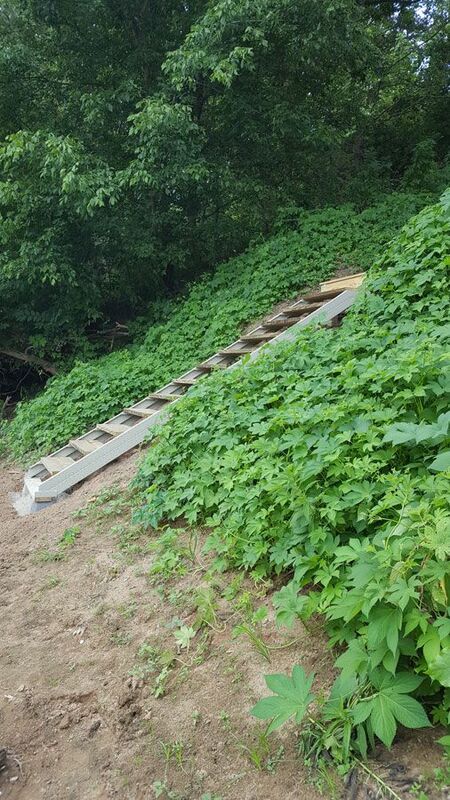 These span a gully and connect two landings in the middle of a set of three staircases. You can be sure that when I rebuild the lower section I'll be using your product. Thanks again for all of your help with the project solution. 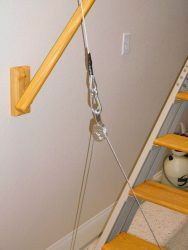 Planning on using your stair stringers again. Here are some pictures after the installation. 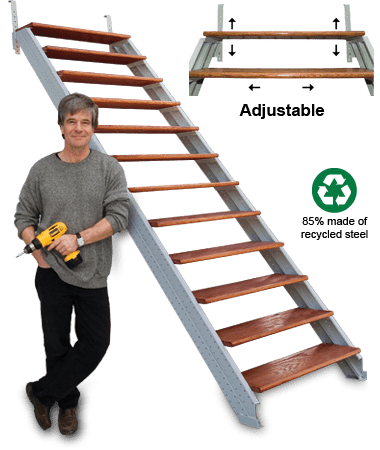 The fast-stairs kit worked well – I am pleased with the product purchase. Thanks for the fast response on the short stringer section. 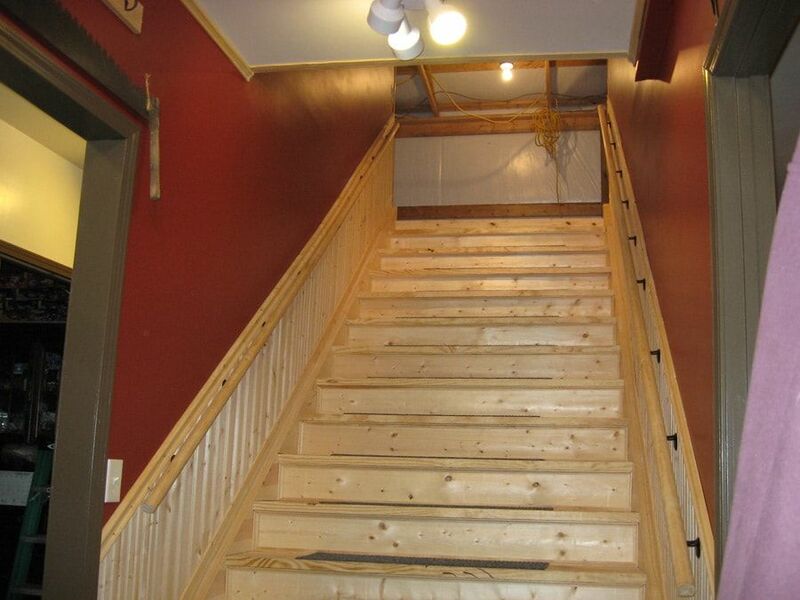 I have completed the stair installation and am now waiting for a railin to be installed. 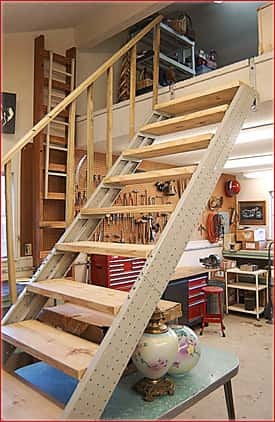 HI Claude, thought you might like to show everyone the Faststairs I put in my garage for attic storage. 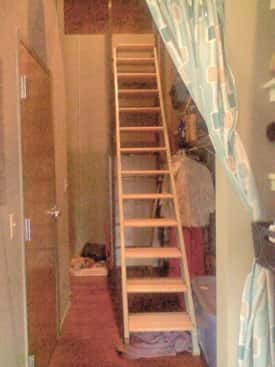 sure beats a drop down ladder! Took me one weekend to do this by myself. You shipped me your stair kit about 2 months ago. Wanted to share with you the final completion to the loft. This is in North Georgia near lake Lanier. 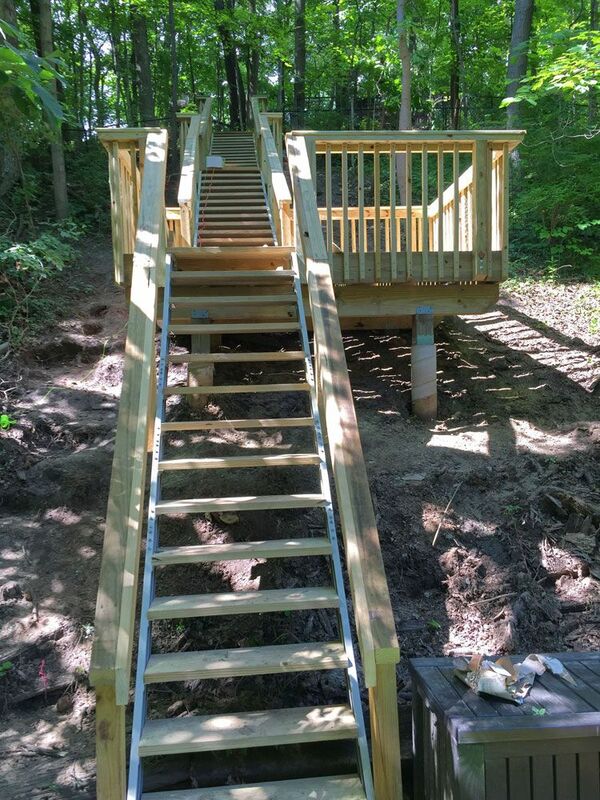 Due to the easy and convenient way the staircase stringers could be handled the stair project turned out to add a real stylish element to our rustic log cabin. 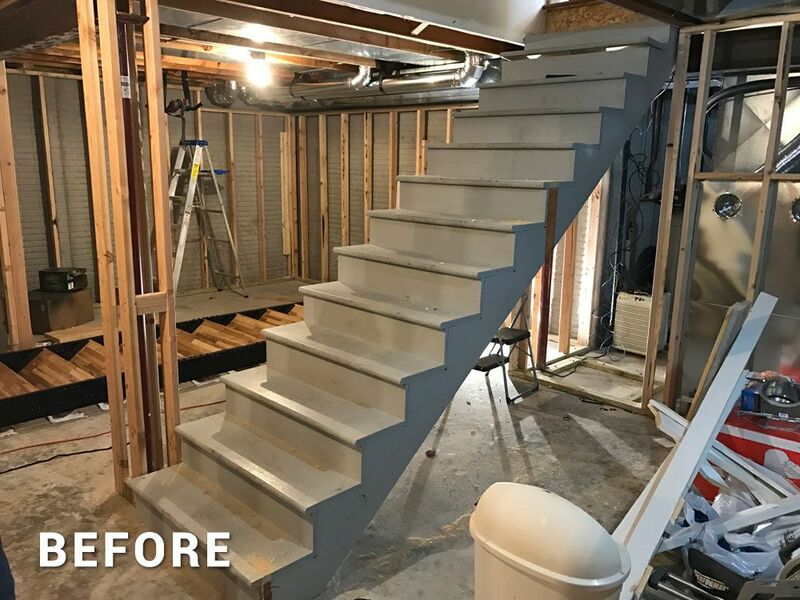 Fast stairs really helped us to complete this job. Attached please find a photo of my completed project. One side is mounted into the studs and the other side is clad with Red Oak. I had a welder come to help me fabricate the railings out of T-bars I purchased from a local industrial metal store. I also ran cable wires through the posts to complete the contemporary look I was going for. For the treads I used Ikea butcher block counter tops and cut them to size. I saved over $6,000 since this job was DIY. 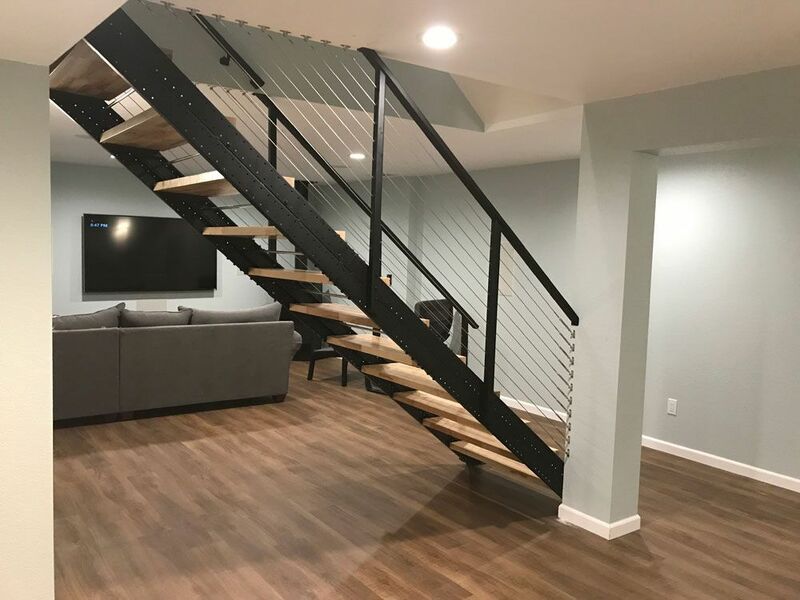 We love your stairs, we do not loose light in the room because of simple structure, stairs are not steep, just perfect for our place and they are only 30 inches wide so we were able to use 2x6 trex for treads and millennium fascia and trim for finish on stringers. Thank you ! 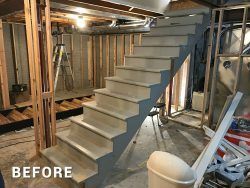 I just wanted to send some photos of our finished stairs project that we completed today, using your P16 model stringers. 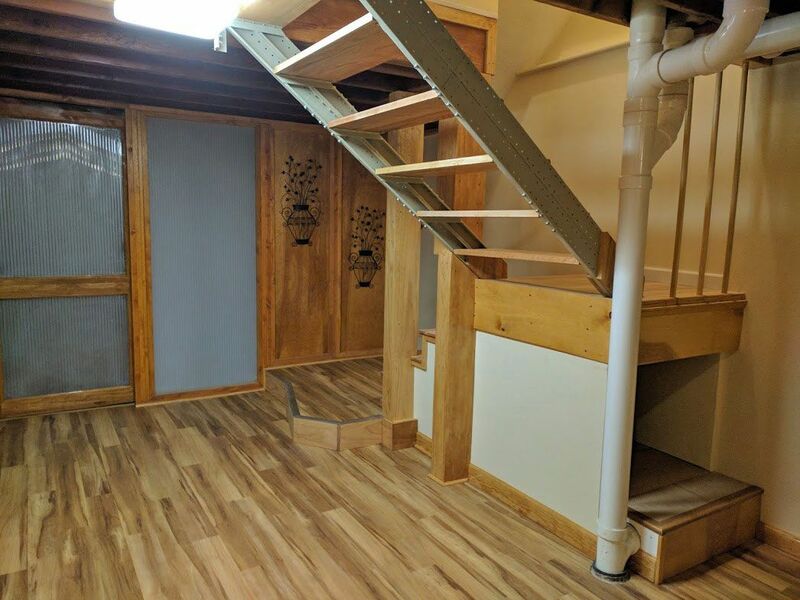 We needed to connect an upper and lower deck in our house that previously had no way to get from one to the other. 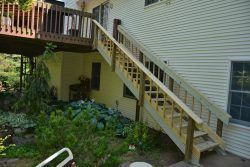 We received two quotes from contractors to do the job, and both quotes were in excess of $4,000. 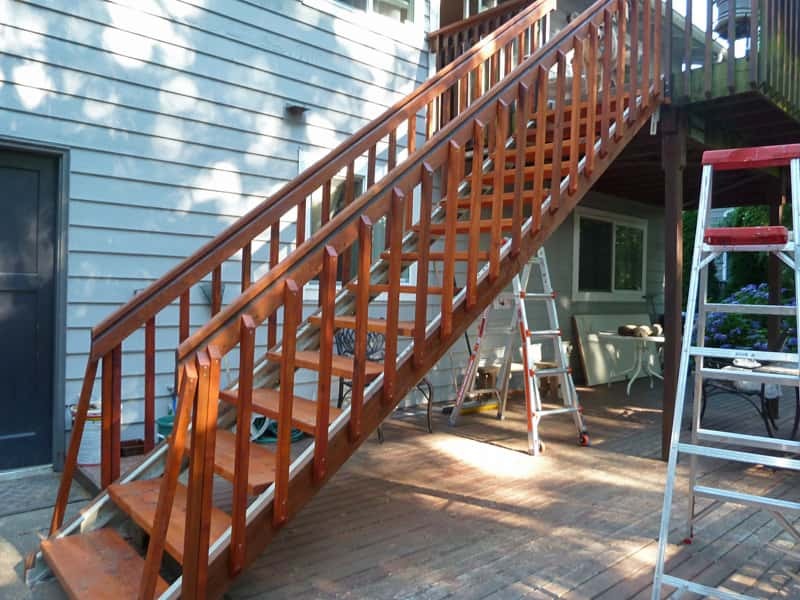 With your stringer kits and the lumber for the treads, rails, and spindles, we completed the job for under $1,000, and everything looks great. 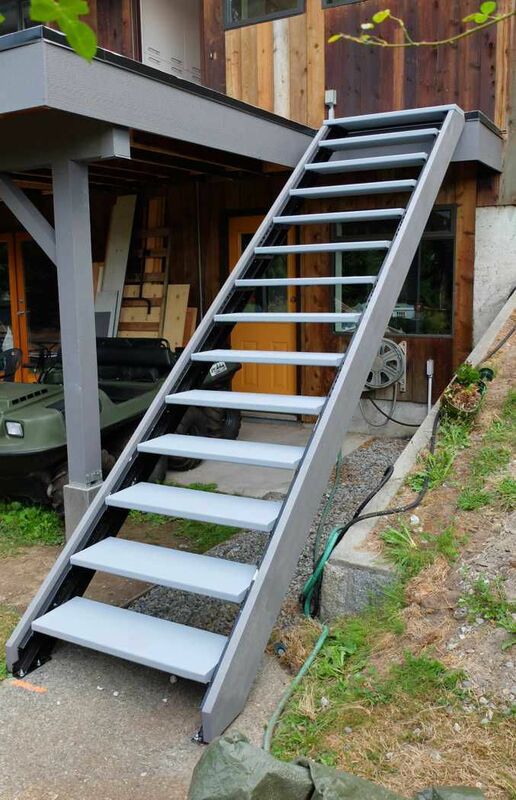 The stairs are very sturdy with no wobble whatsoever, and everything was very easy to install. The stringers look great and work perfectly. I would highly recommend to anyone considering the purchase of your metal stringers that they go ahead and order - they won't be disappointed! 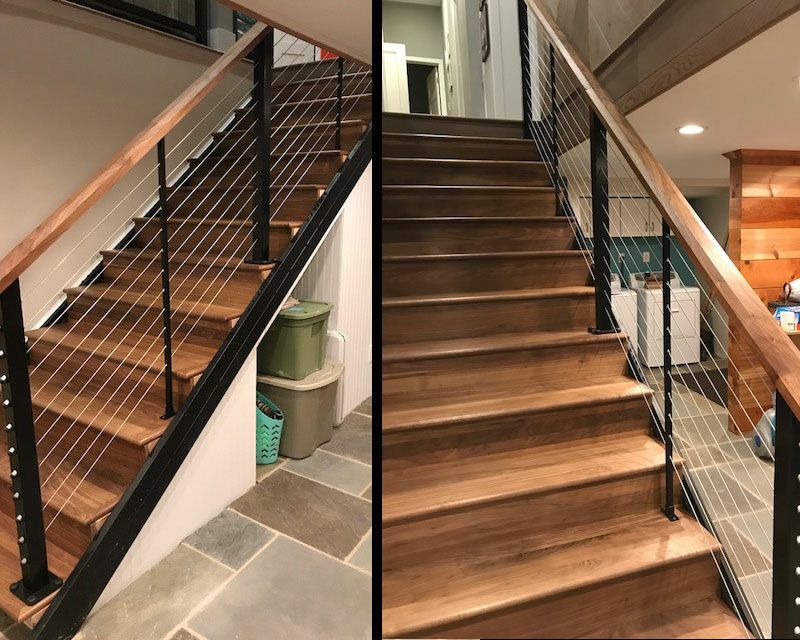 Please feel free to use these pictures on your website if you are interested - I didn't see many examples of running a staircase using your stringers from one deck to another, so hopefully this gives some future customers some additional ideas on their use. 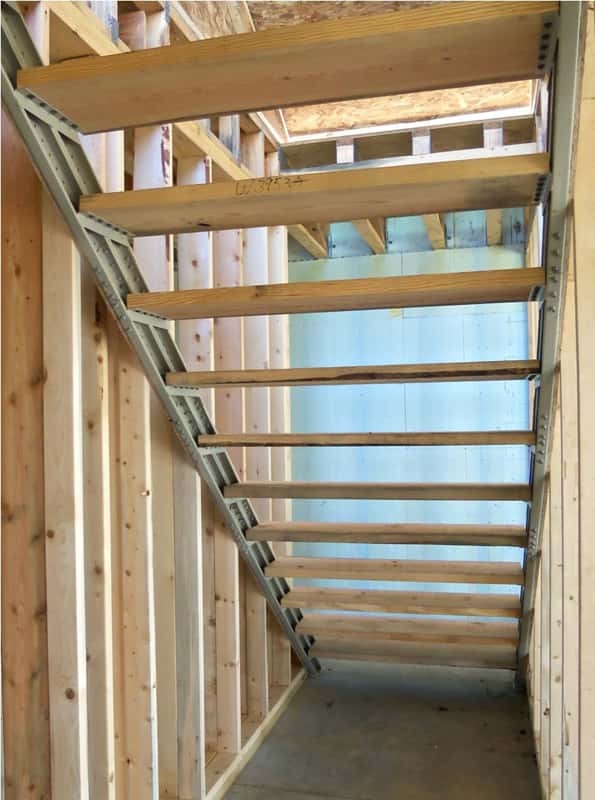 The stairs have been framed. I thought you would enjoy viewing them in the attached images. Thank you again. We are very happy with the results. Photo is attached. The stairs are great. Looks great and primed and painted with rust-proofing. 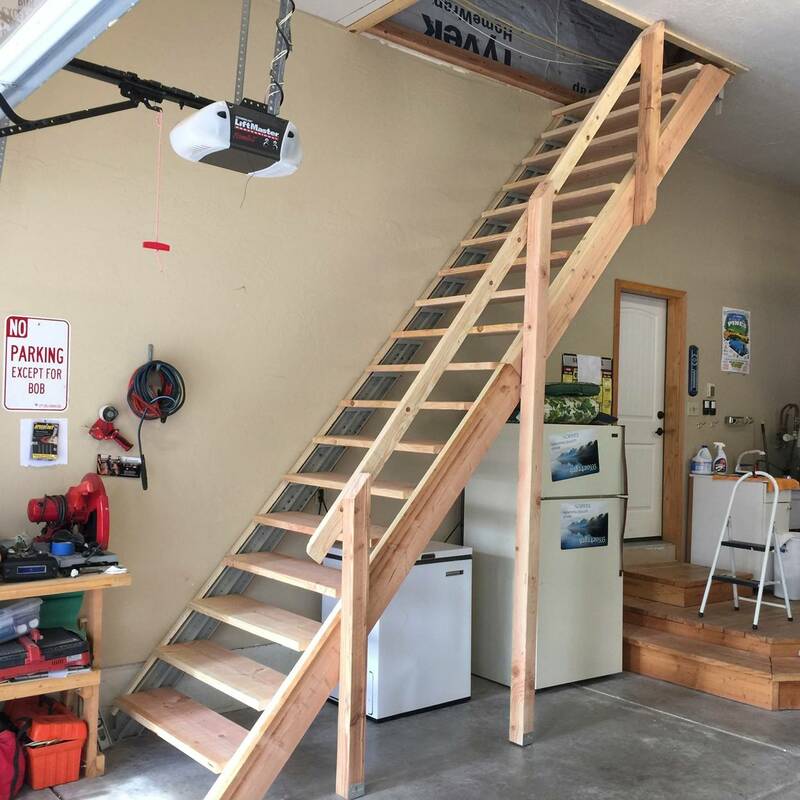 Your product saved me a lot of measuring and cutting to build my own stairs. 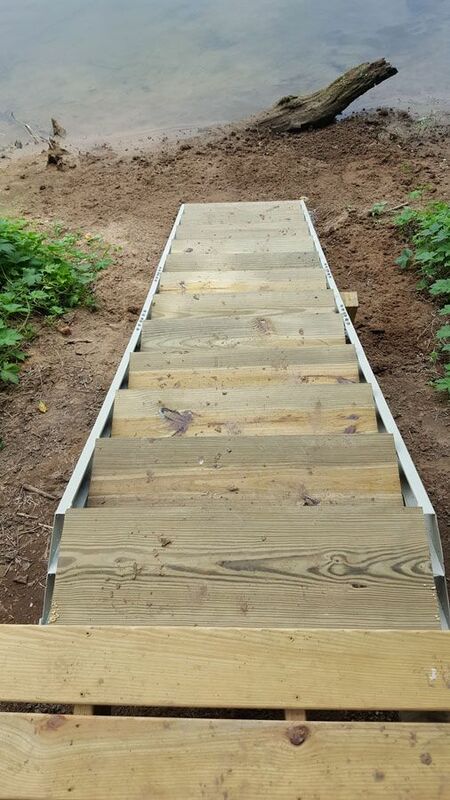 Took only a few hours to assemble the risers, cut the treads, and assemble the stairs. Thanks for making this project a success! Thank you for your great product! The stairs look very nice, and assembly was very easy. 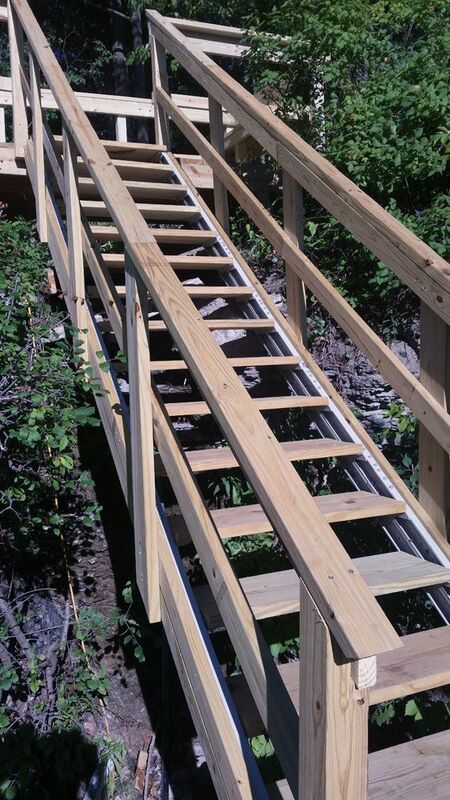 Removable hand rails made out of square tubing. Great stairs. worked well for my project. Excellent system, fast and sturdy. Would definitely order this product again. Here is the finished product. Thank you. We love our new stairs! 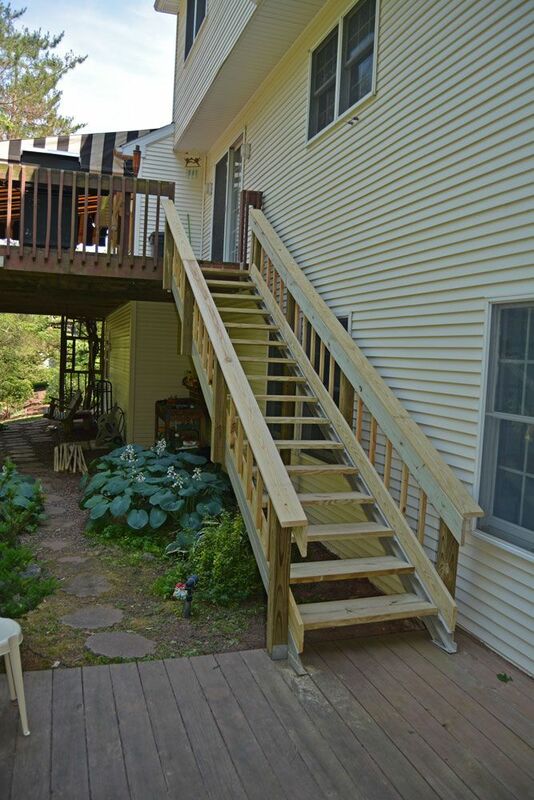 These stairs are very sturdy, much sturdier than the ones we replaced. Thank you. 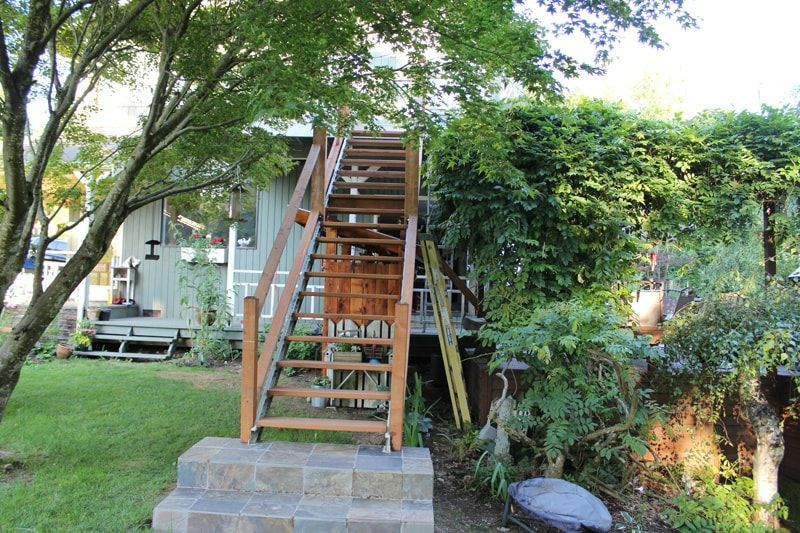 This is a great stair that replaced my old rotten wooden stairs. Who needs carpentry experience? This product is so easy to build. I feel lucky to find you on the web. 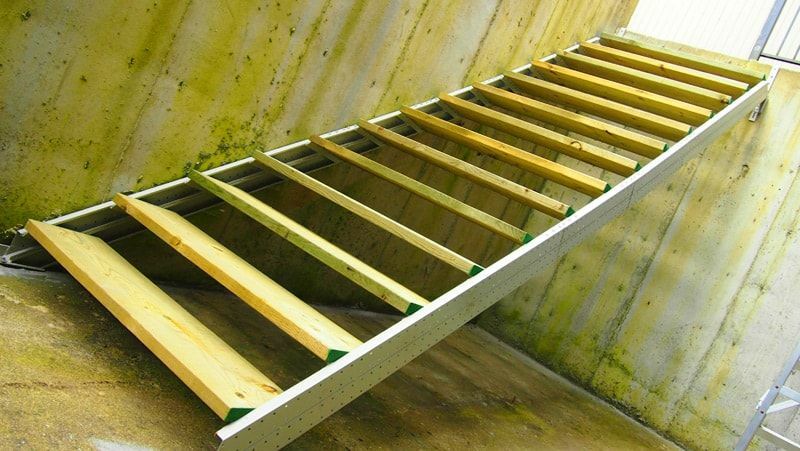 Your stairs are great, easy to install. Just ordered another set for another house. 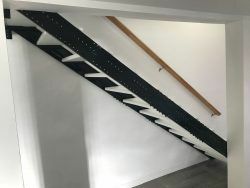 The Fast-Stairs product did not come up short of its description from the website. It was simple to assemble and the dimensions were perfect. 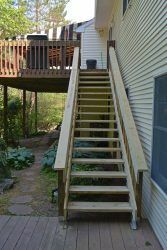 Prior to discovering your product, the biggest challenge with installing stairs on an exterior attached deck that measured exactly 106" tall was finding a product that met my needs and would not be a high maintenance material. I ordered the stringers that was exactly 106" with 14 risers. It lined up perfectly and I was able to reduce one riser from the original stairdesign. 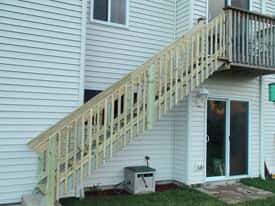 From my picture you will be able to see that it was possible to build low maintenance stairs and railling by using powder coated materials. 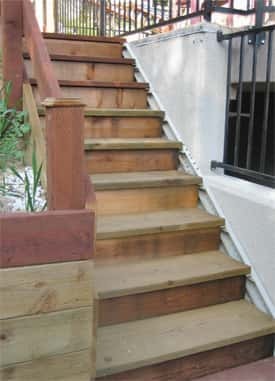 The only maintenance to anticipate is the replacement of individual stair treads as Southern Alberta winters take their toll on the pressure treated wood, but not for a few years. Replacing a tread should be just as effortless as the original assembly. I love my stairs! My son-in-law, Roger, installed them easily. 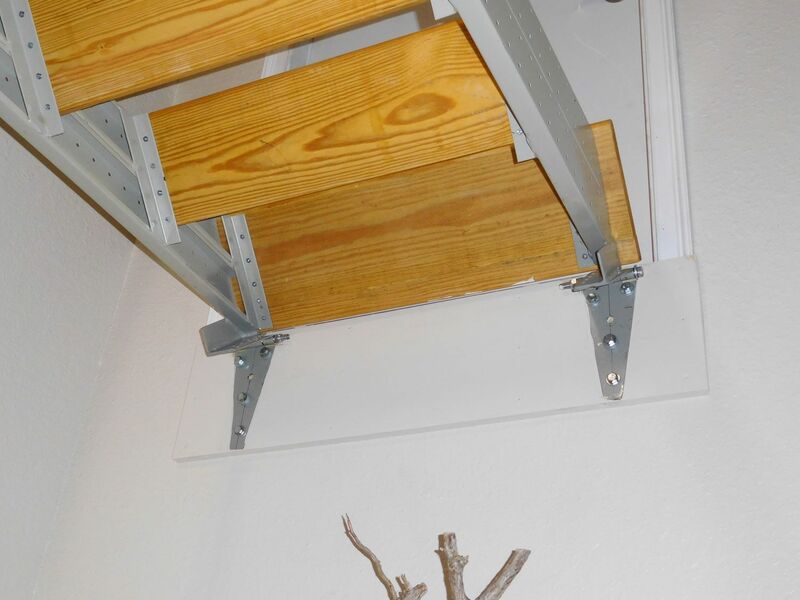 He fitted them to my specifications and added the bannister for my support. I work on my roof periodically doing maintenance and the ladder was just getting too much for me. Attached are my pictures for your use and you can add this testimony. Thank you for creating this product. If there are any questions please feel free to email me. I just wanted to thank you for making/marketing such a great product! We purchased our set of the Space Saving stringers for a project in our basement. 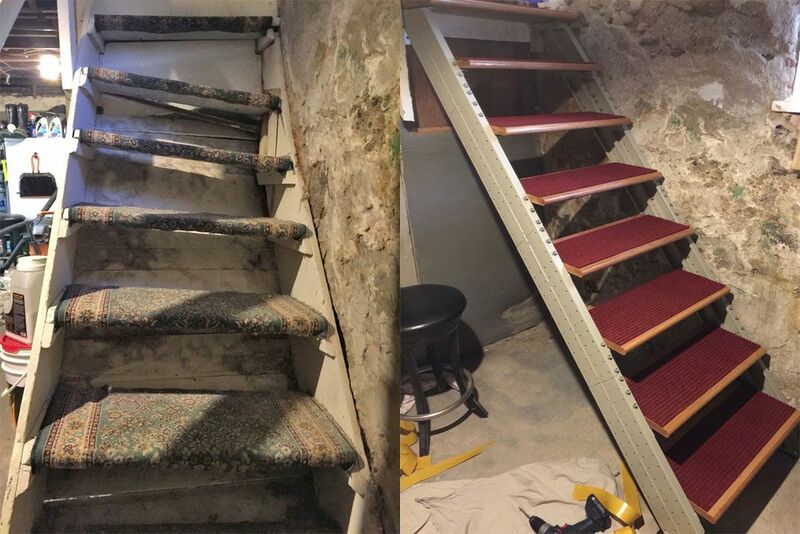 We were taking out the old wooden steps to make our basement more "flood-friendly" because we have flooded several times in the past. The door frame was a smaller size than normal and we were really stuck on how to accomplish this...until we stumbled across your website. You were kind enough to speak to my husband on several occasions before we ordered so we knew we were ordering what we needed to have. We decided to go with the Space Saving C model so we could have more clearance at the bottom of the stairs to walk around. They went in pretty easily and we found their flexibility to be just what we needed. 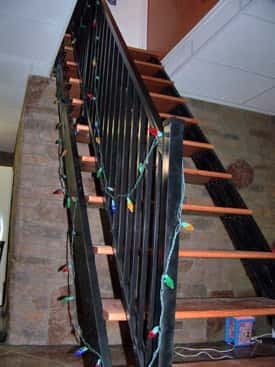 As you can see, we painted them black to match our decor and added our own touch with stained oak treads. 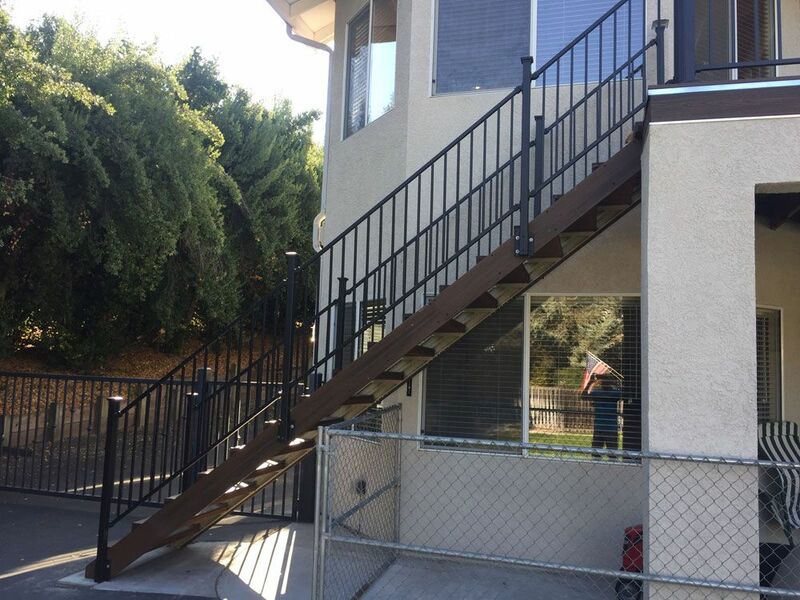 We added a railing quite nicely. Again, I can't thank you enough for your quick delivery and great customer service! 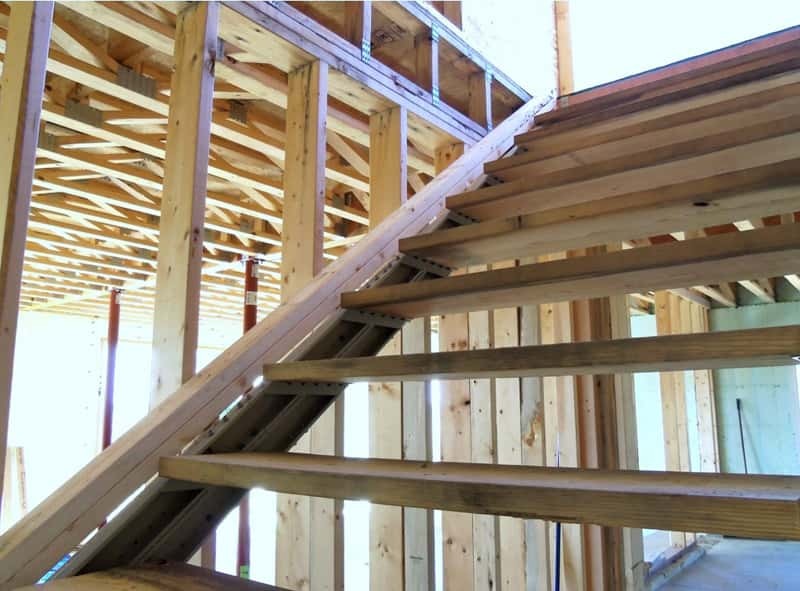 Attached you will find several pictures of the stairs in place. Thanks!! 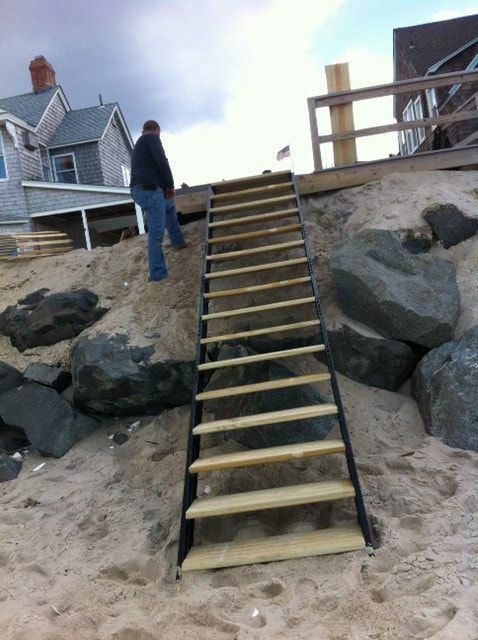 Please find attached a photo of our stair installation. In the image you'll notice a vertical ladder attached to the workshop wall on the left-hand side of the photo. I am 63 and my wife is 59. The ladder had become unsafe for us to use for access to the workshop loft. 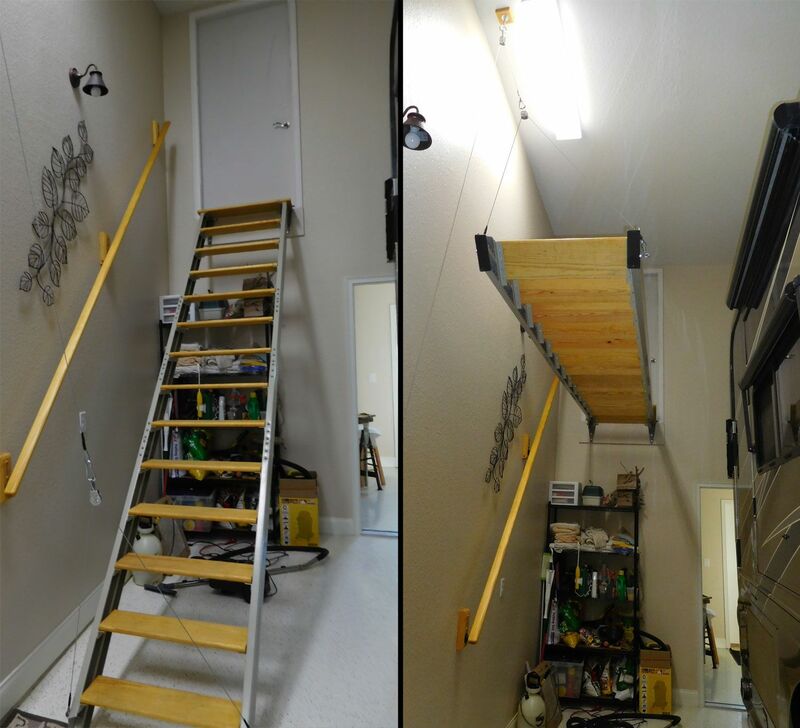 The Fast Stairs installation has completely solved the problem and restored about 300 square feet of valuable storage space. The treads are just 2" x 10" x 30" cut pieces of lumber. 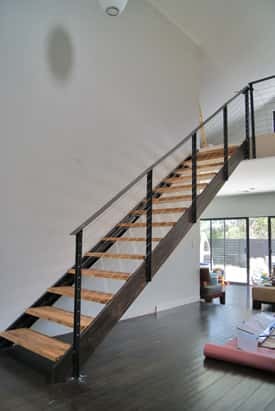 The hand rail is made from prefab pieces purchased at our local Lowe's. 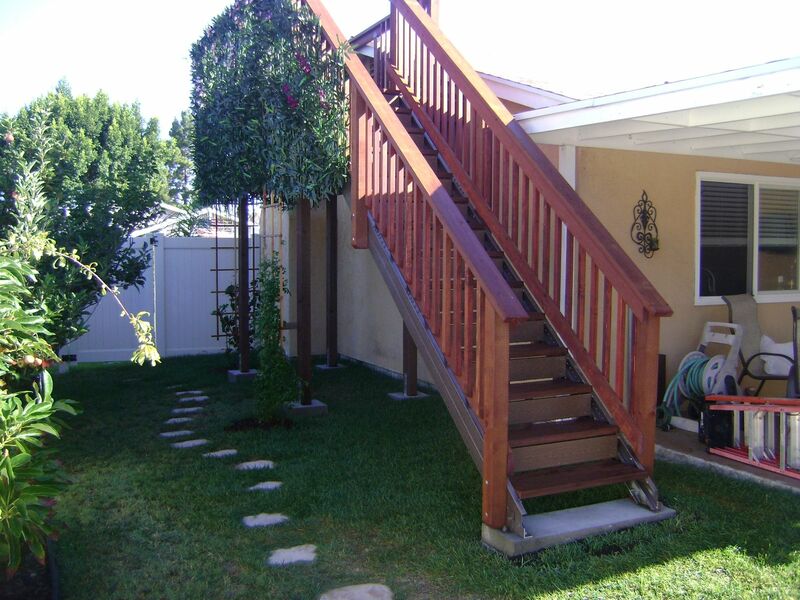 The cost of the treads was about $30 and the railing less than $20.00 for everything you see. The total cost of the project was under $400. One of the contractors had given me an estimate of $1,000 to build the same thing out of wood. The entire installation, including the trip to Lowe's, took less than two hours to complete working by myself. Many thanks for a fantastic product. I will be recommending the Fast Stairs stringers at every opportunity! We installed an A10 at our cottage in Northern Ontario last weekend. Assembled as easily and fast as advertised. Exceptionally stable and sleek looking. 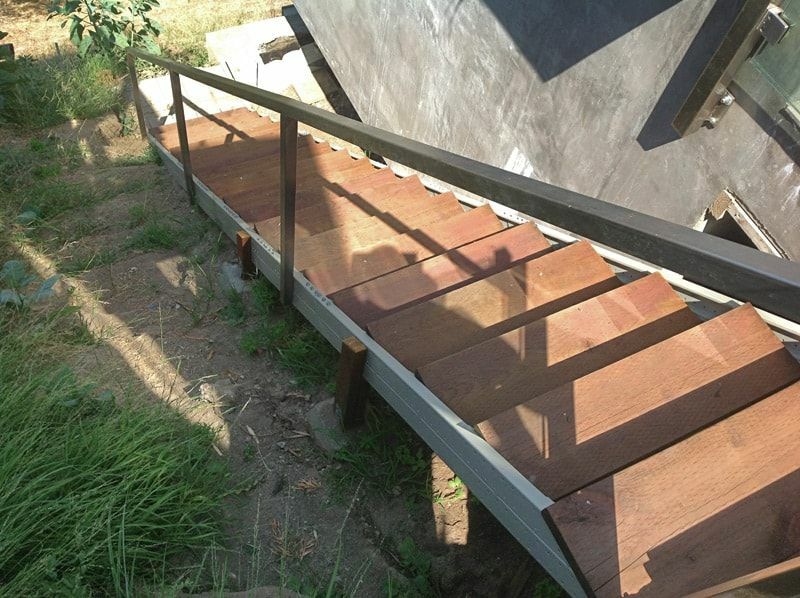 The two stairs we installed at our family cottage are fantastic and everyone is very impressed with them. 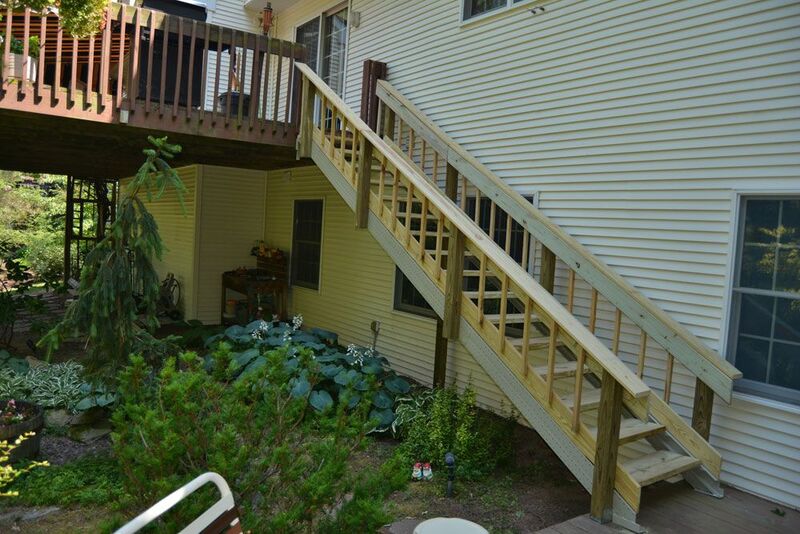 Attached are the pictures of my finished Stair project. 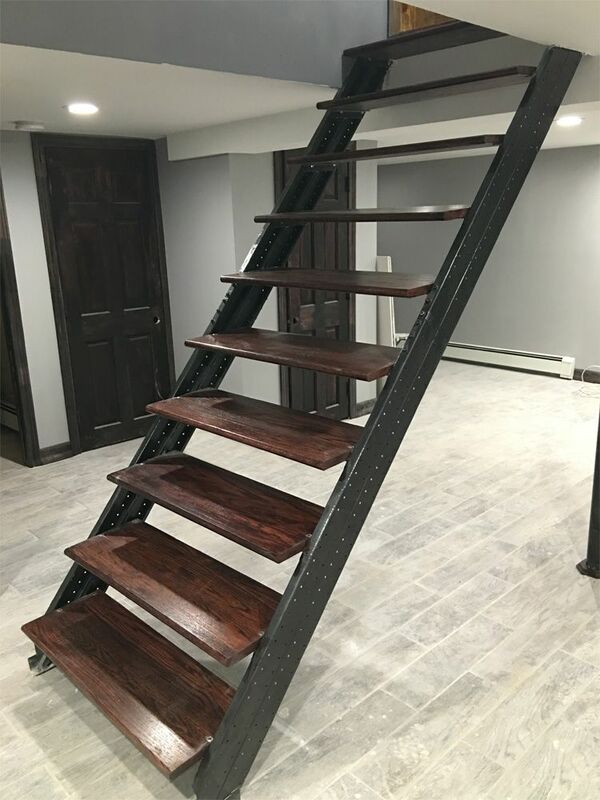 These stairs are GREAT, my wife can now let the dogs out into the back yard without having to walk all the way into the basement to let them out! I had some help today and got the stairs up. None of us could believe how we just stood them up out of the back of my pick up and walked them over and let the hooks fall right into place on the deck. Believe it or not, they were actually level and the base is on a packed stone driveway. We had to check it three times before we believed it. 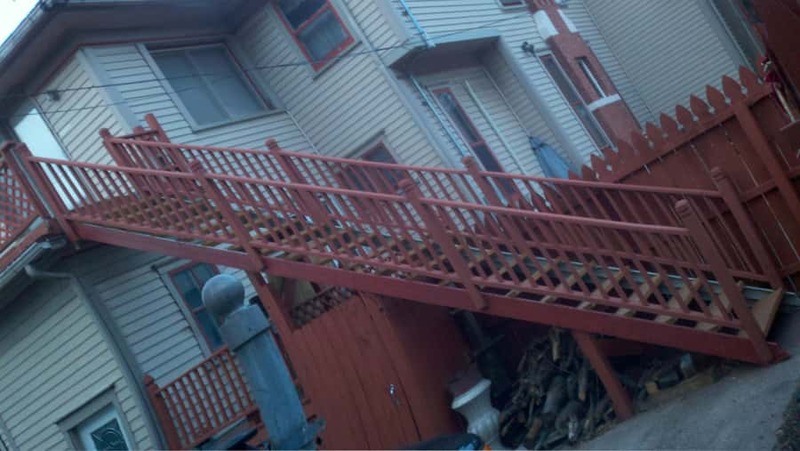 I have to pick up some wood for the railing but That will be a breeze now. 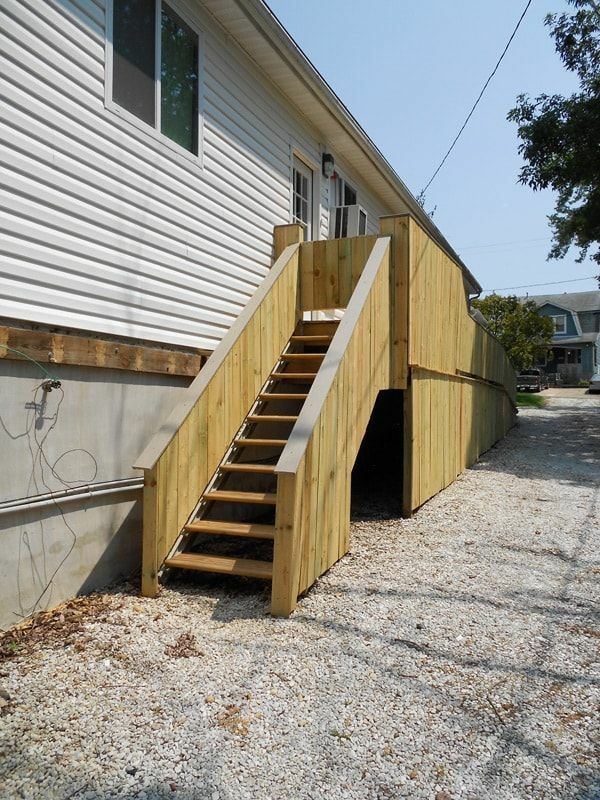 I am also thinking about putting risers on the back of the steps for the dog. I would recommend this process to anyone who wants strength, uniform looks and ease of installation. Thanks again for helping me. 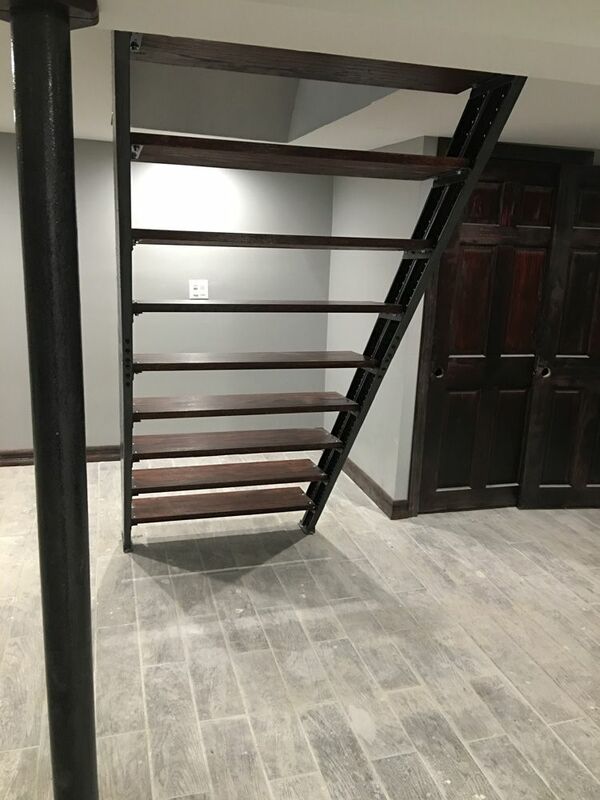 I have finally installed my new basement stairs and absolutely love them; they feel 100% rock solid, which is a night and day difference from what we had before (pretty pathetic looking, not to mention dangerous). They were very easy to put together. Thanks. I thought I would take a couple of minutes to congratulate you for an unbelievable engineering job. I received my kit and had it up in a very short period of time. It was everything your web site said it was. I would highly recommend your product to anyone. 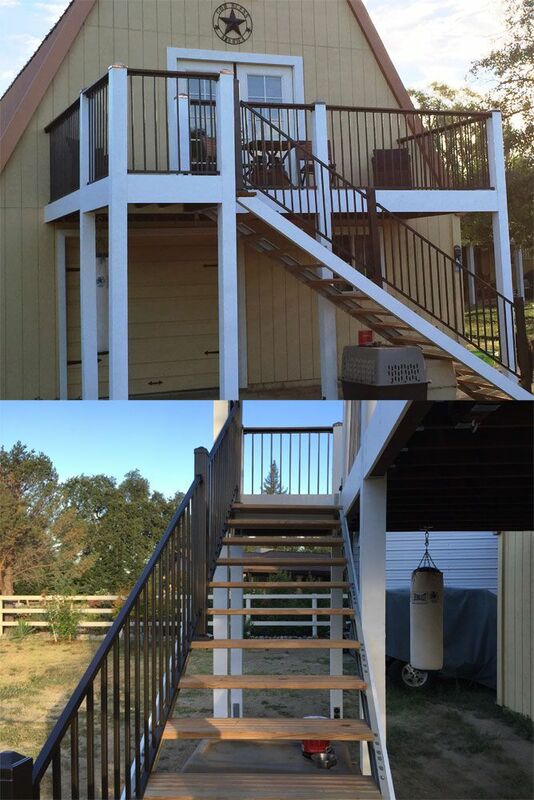 Completed my Fast-Stairs project and it really is some of the best work I have ever done. Fast-Stairs pushes the bar way up and you just cannot do anything else but your best. How can I send you pics? Can't say enough about the quality. 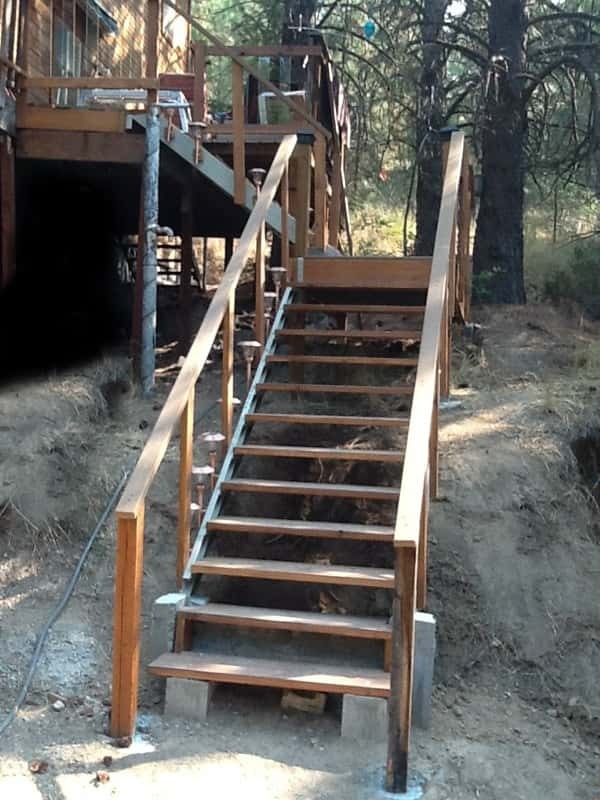 I have the smartest stairs in California! "Recently purchased your C-10 stair package.It worked perfectly for our space which a contractor spent 2 days trying to figure out. We received it quickly and installed them in about 1/2 a day and trimmed them. We are going to order them again for all our rehab projects, even the inspectors were impressed. Thanks again for making our projects easier." "A top pick out of our 2007 product showcase... 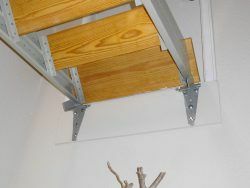 The safe, rustproof powder-coated stringers set up and adjust easily for basements, attics, lofts, condos, post-frames, storage, garages, warehouse, barns, cabins and outdoor uses including roofs, decks & construction job sites." We got the stairs and they are great. We will be wanting more. 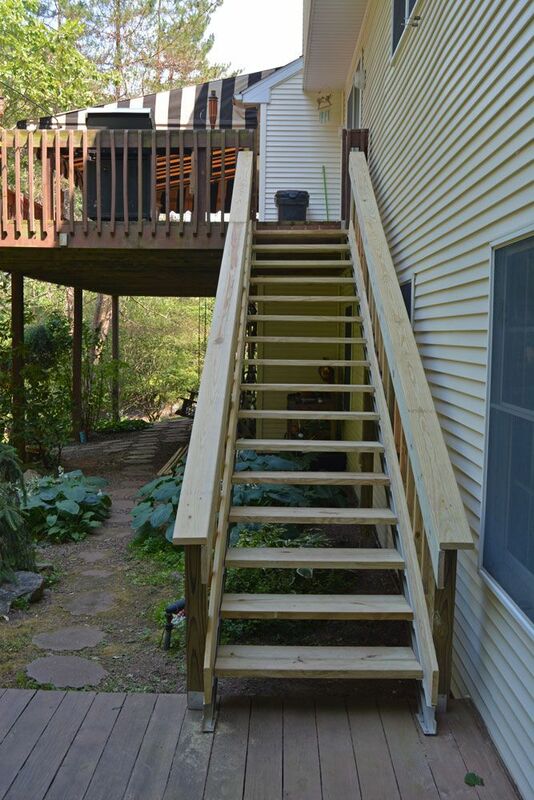 I have a project that need stairs that are steep. I have about 8 1/2 feet on the floor to go 7 1/2 ft tall. Ideas? 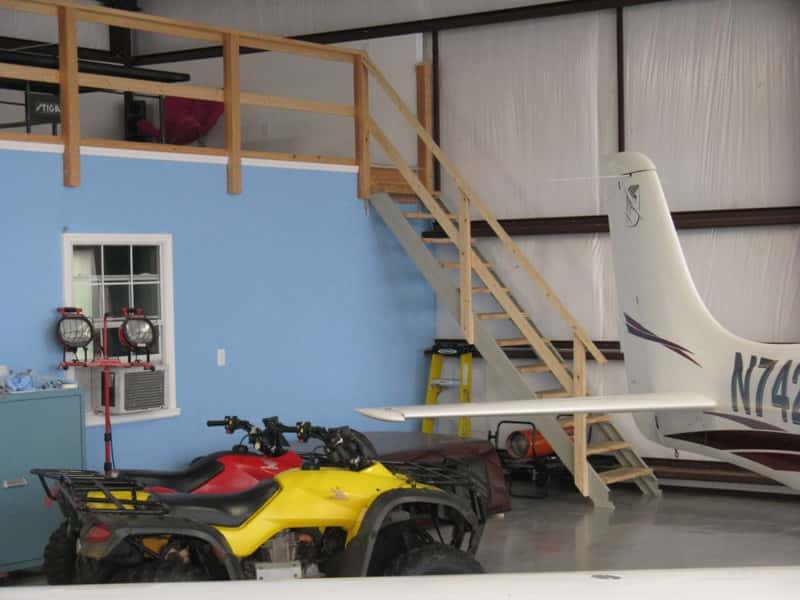 It is a loft storage space not a high traffic or public space issue. 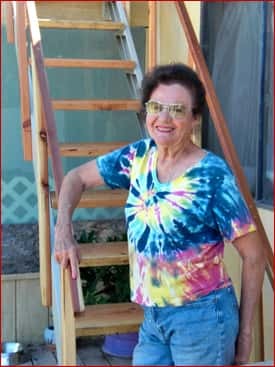 I just wanted to tell you that I received the stairs yesterday afternoon and just completed installing them. They are very nice and were extremely easy to install. Thank you very much. Installed the stairs today. It went very smoothly. Thanks for a great product. Thanks! Great product & service. My second set of stairs from you. 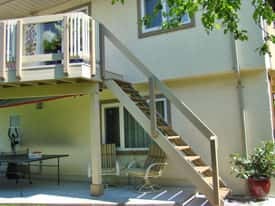 I will send pictures of installation on my deck! 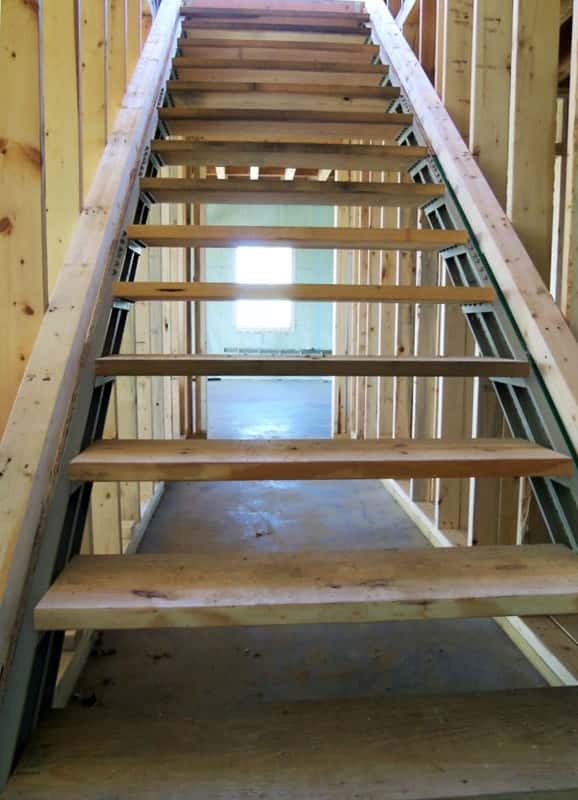 The stairs are up and they're great! 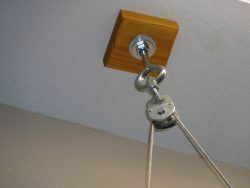 ...the product was fantastic and have told many people about it and would not hesitate to purchase again in the future. I wanted to let you know I got my shipment of the stair stringers on the 14th as promised. I have installed them and they work terrific. They are easy to assemble and work with. The strength engineered into the design is amazing. 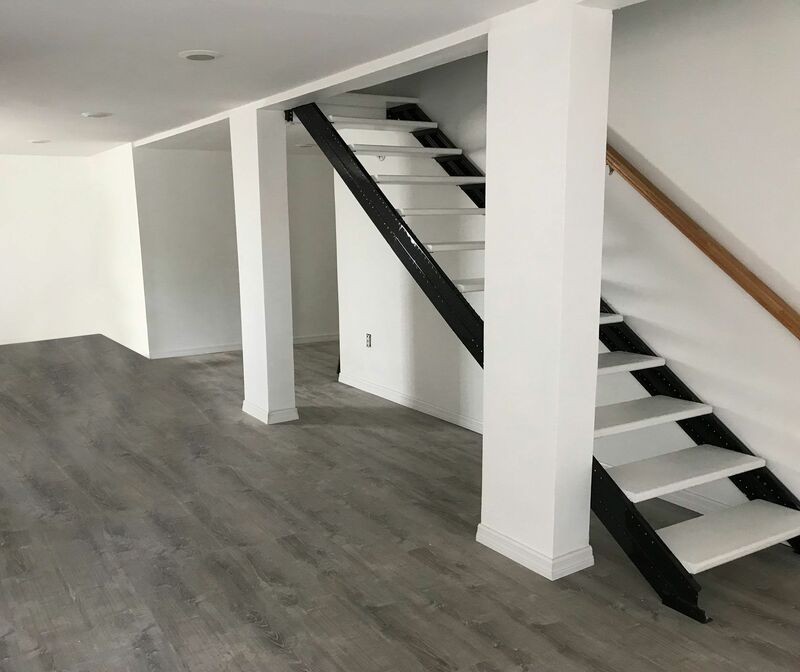 We received the fast-stairs on Friday and they are perfect. Much better than expected. The material is built to endure a lifetime. Thanks for a great product. Assembly was very easy! Our first house project since the birth of our son and we were able to do it all during his afternoon nap. 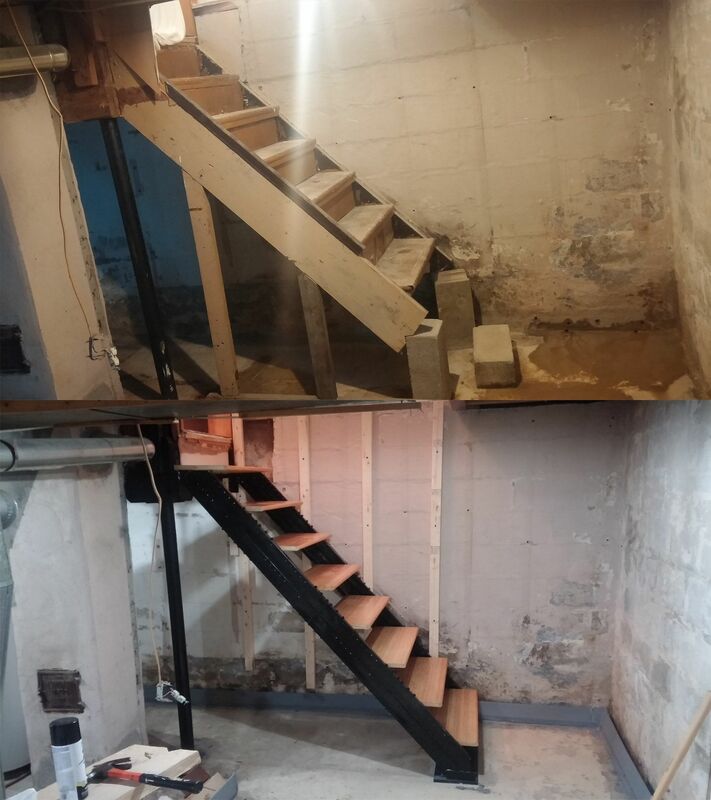 Basement is prone to flooding so we are looking forward to having these steps much longer than the last ones! Thank you! I had never built a stairway before. One was required for the remodel I was planning for my newly purchased "fixer-upper" home. I surfed the Internet for ideas and came upon Fast-Stairs.com and talked with Claude Ranger on the phone. I bought package WS2 and proceeded to build a perfectly beautiful 4ft wide stairwell by myself. 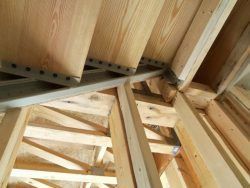 The cost in money and effort for these steel stringers was less than that of wood stringers and were easier by far to erect and level perfectly. I recommend them without reservation. Thank you, Mr. Ranger, for your quick reply to my questions during construction. Your support of these products is excellent.